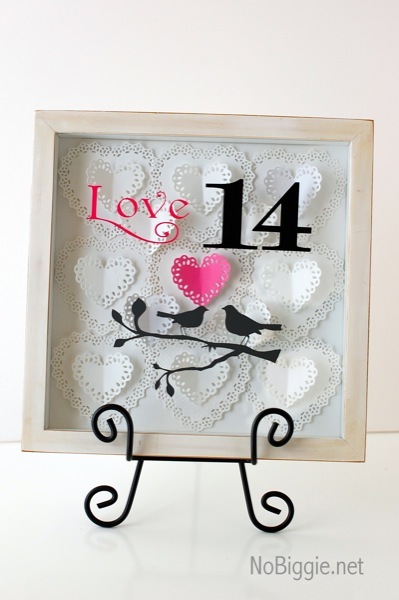 Here are 5 projects to get you in the paper crafting mood for Valentine’s Day. 1. 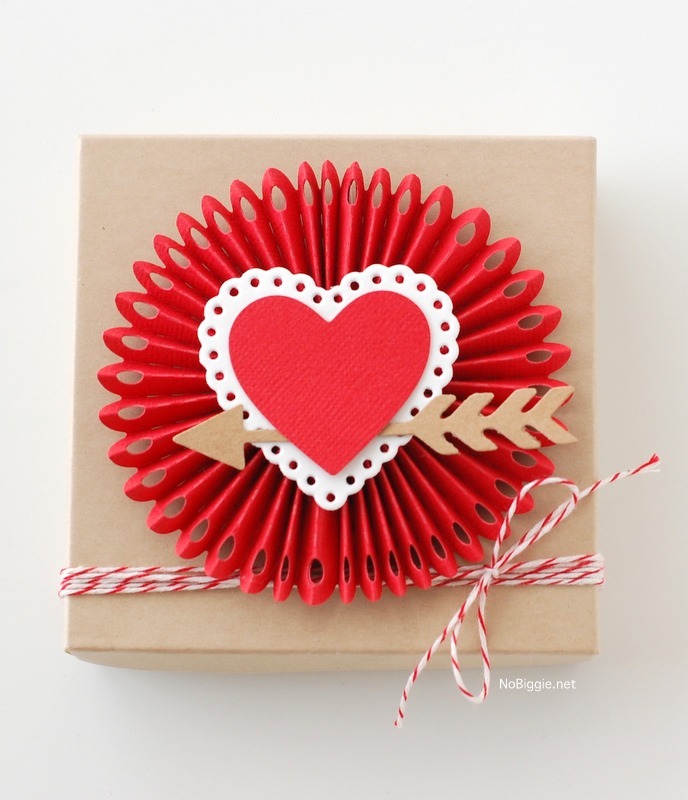 Rosette Heart Box: With the new rosette die, it makes rosette making so easy! I have a few of these natural brown jewelry boxes, and this heart, eyelet heart and arrow die help make it a fun gift topper. Along with a little red and white baker’s twine (of course). 2. Valentine’s Day Shadow Box: This project came about when I found this cool shadow box at the thrift store and I was looking for something fun to fill it with. I first covered the front of the glass with these cute love birds in vinyl. On the inside of the shadow box, I filled it with the nesting doily hearts… all white plus one hot pink. I later took the #14 off as I think it looks better without it. Plus people were saying “What’s the 14 for?” (Feb. 14th of course!) Aren’t shadow boxes cool?! a thrift store score for sure! 3. Heart Doily card- This card is pretty simple, but the heart doily die makes it fun. Along with a little Washi tape and a simple clear stamp via Martha Stewart crafts (a few years back). 4. 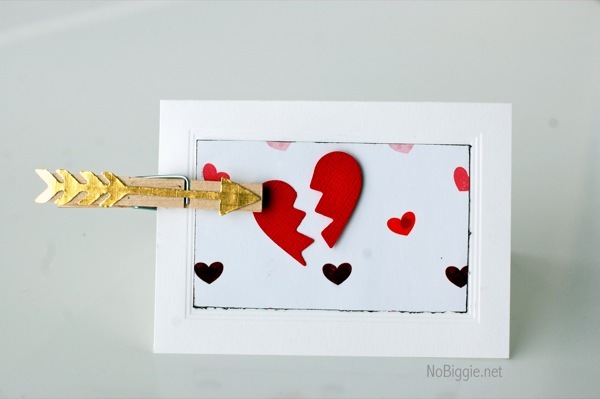 Broken Heart card – My favorite thing about this little broken heart card is that the gold arrow fits perfectly on top of the clothes pin. Just think of all the possibilities with all these little arrows! For all of these cutting dies featured here, I used the We R Memory Keepers Evolution (die cutting and embossing machine). I’m in love with the shadow box! I love the birds & the little pop of pink. Adorable! All of these are wonderful but I think #1 is my fave. Just something about the delicate yet simple nature of the doilies and the contrast w/ the branch , bird and pink heart just makes it all pop. They have some incredible dies…I just wish I could buy them all!! Hugs Kami. 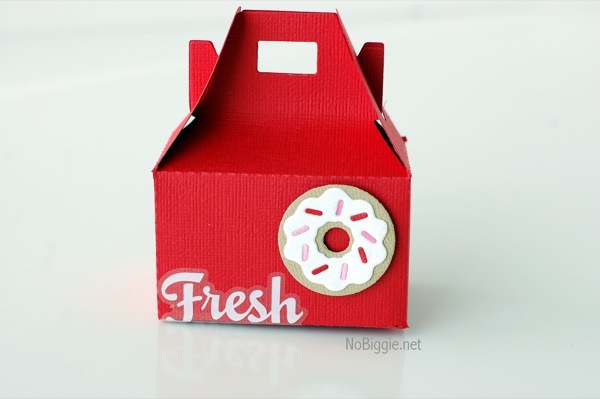 The mini donut box makes me laugh. And you’re right about the arrows on clothespins – those would be great everywhere! I love the first one so delicate and beautiful and I liked it with the 14th. My fill in the blank would be chocolate! LOVE these!! They all look great! I like the little box with the rosette, heart and arrow…and of course bakers twine!